Open Ended Question Prep for ESL! Hello! I hope everyone has been having a good week so far! I realized that I talk a lot about my younger students, but I haven't really talked about my 8th graders on the blog, so I'm going to share a little bit about what I do with them. Since we got back from Christmas Break, I picked up writing in a huge way, and we've completed two really big writing pieces that I'm pretty proud of. There are only three students in my 8th grade class, (I know!) so we can get a lot done in just a few weeks' time. However, if just one student is absent, it makes a marked difference and I feel like I'm pulling teeth to get anything done. First we covered narrative writing, then moved on to speculative, and now we are moving on to Open Ended Questions. (More on that in a minute.) I do something pretty fun for their Do-Now- we do 5 Minute Writing from a Scholastic e-book I have. I project a prompt on the board, something like "A magic fairy gave you $1,000. Write a story about what you would do with it." Then, they have 5 minutes to write a paragraph with a topic sentence, three details, and a concluding sentence. We read our paragraphs aloud (I write one too) and we check each other's for the necessary components and mark them up with pens or highlighters. My students have a love/hate relationship with 5 Minute Writing, but we have had some great stories! Moving on to Open Ended Questions. If you teach in NJ, you know all about OEQ's. They are the bane of an ELL existence, because they require very little imagination and a lot of background knowledge. I broke out a book of non-fiction reading comprehension passages and we began working. The passage we worked on was about earthquakes, and boy did we have our work cut out for us. 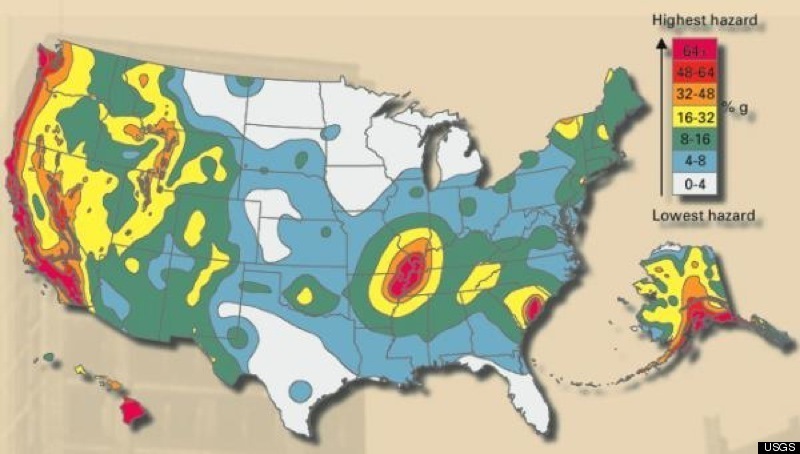 We talked about the word "shift", we experimented with an earthquake on our desks, we stared at checked out this SUPER COOL earthquake website, we looked at this fault line map, and then we talked about Pangea (one of my top 10 favorite science topics!). Realizing how much material (from a book written on a 3rd grade level) that they do not know only makes me want to work faster to cram everything in. Clearly, that's not realistic. But what many people do not understand about ELL's, especially SIFE's, is their lack of background knowledge about the things we take for granted. What are SIFE's? Click here. Finally, we moved on to the Open Ended Question at the end of the passage. I created an anchor chart to help them organize their ideas, and I'm sharing it with you. Because after all the trouble we had with reading, they shone in their writing! 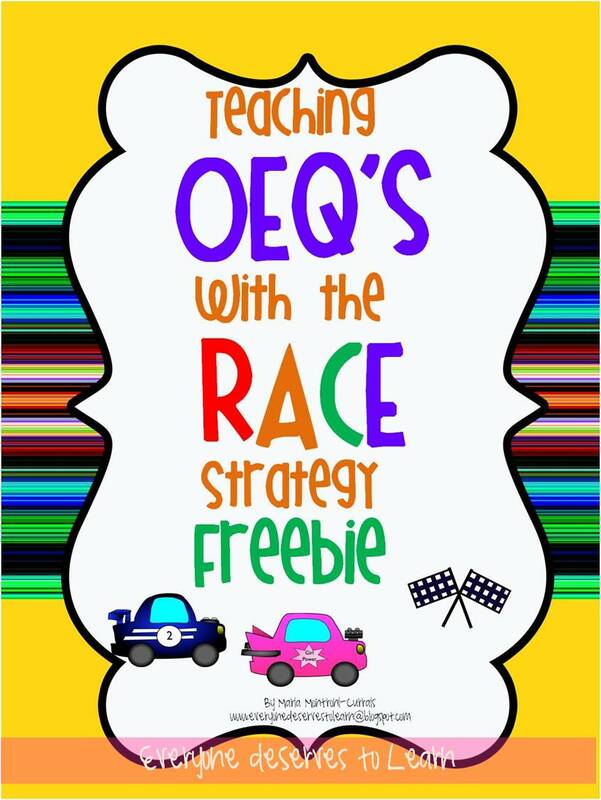 We aren't done yet, but I wanted to share my freebie with you in case any of you are working on OEQ's soon. Click on either picture to download the freebie. Not only do we have the state test, but we have the ACCESS by WIDA test coming up in April, which measures ELL's on Reading, Writing, Listening, and Speaking. I want my students to be prepared, but I don't want to drown them in test prep- I think guided reading and writing is a good way to do that. Let me know what you think about test prep for ESL students, and does your state take the ACCESS test? How do you prepare your kids? 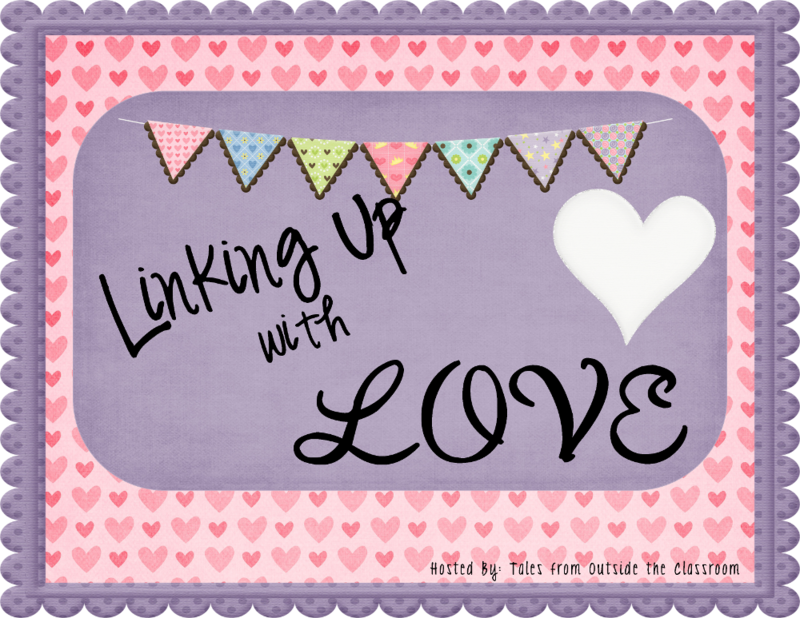 Tonight I'm linking up with Tales from Outside the Classroom to share some things I love. The first thing, and you may know this about me already, is that I love to cook. I love the cooking blogs that I read, I love Food Network, but most of all, I love Ina Garten. She taught me to cook. Not in person, of course, but I'm such a visual learner that I would come home from school and watch her show, then get up and make exactly what she made. I really feel like I owe a lot (of pounds) to Ina, but it's well worth it! Second, I love Chai tea. It calms me down and my husband makes me the best chai tea lattes on the weekends- he won't do it during the week! Third, I love my students. Some of these kids came from living in deplorable conditions and survived traumatic experiences and yet they greet me every day with a huge smile and a joke. I have tried to make my classroom as safe and positive an enviroment as it can possibly be. I use music as often as I can, and teach with a smile. I have a general idea of the kind of families some of my kids go home to, so I want to be the best role model I can be for the short time they see me. I mentioned that I teach with music- I'm desperately trying to give my kids an education in all things American, like jazz, rock and roll, country, and showtunes. Earlier this year, we learned about scarecrows using the Wizard of Oz. If anyone has a better way to teach about scarecrows than that, please let me know. In February, we're rolling back to the 20's and 30's with Frank Loesser's song "A Bushel and a Peck." with a 2013-style remix! In 8th grade, I'll turn this into a lesson about irony, and in the younger grades, we'll learn about opposites and differences in size. 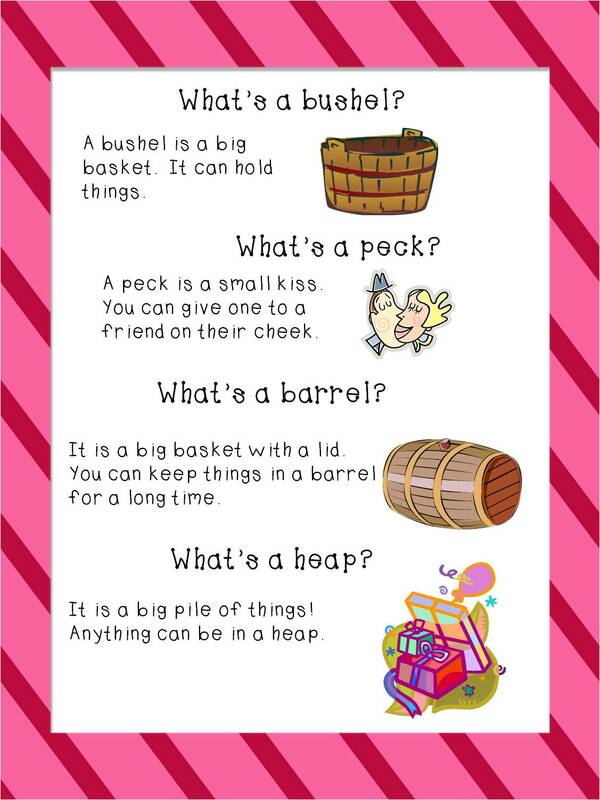 And since no one really uses the words bushel or peck any more, we'll do some vocabulary exercises to understand what they mean. I made this anchor chart to help my visual learners understand the words while we listen to the song. 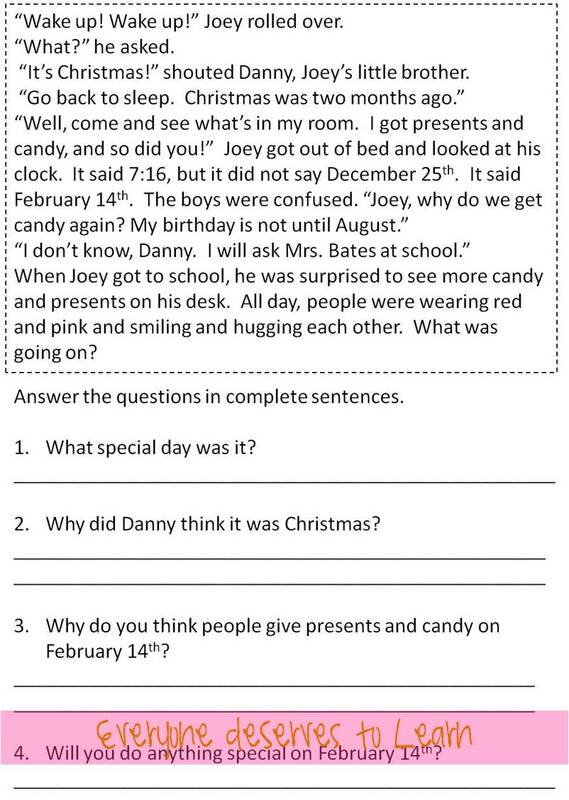 My students need lots of help with reading comprehension, so I wrote a Valentine's Day Reading Comprehension Passage that's targeted directly to their level. This one was written for my second graders, but can be used above or below as needed. 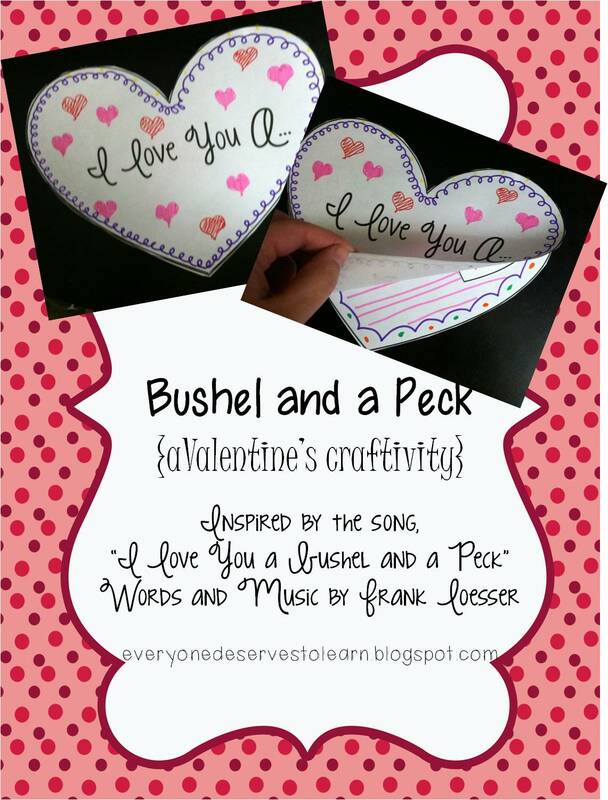 To see more about this Valentine's Day Craftivity, head over to my TPT store. 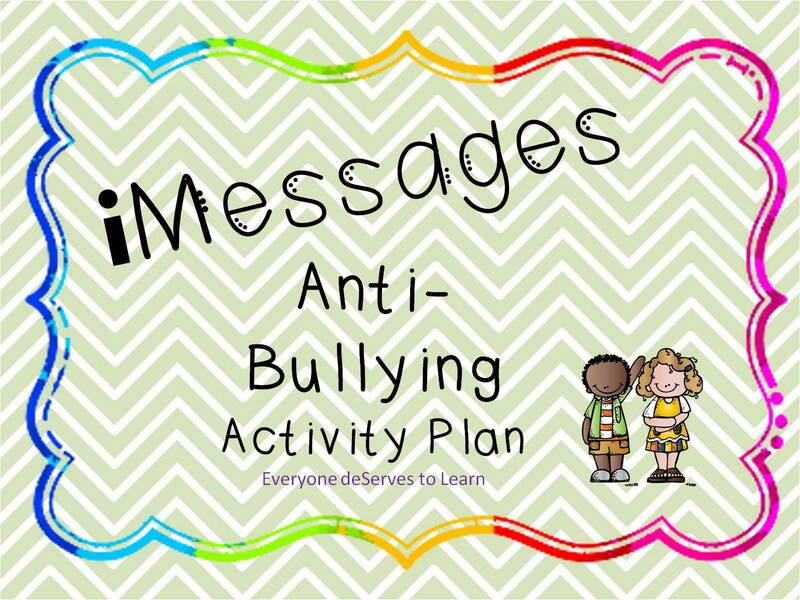 Anti-bullying is such a buzz-word in schools now- how do you get your students to be friends? 1. In honor of MLK Day, my students listened to the I Have a Dream Speech on YouTube. When it was over, they clapped. It was awe-inspiring. Then, I did a lesson with my students about using iMessages to express emotions. They learned how iMessages can express happy, sad, excited, or angry emotions, and we practiced them in different situations. I took the picture after I laminated- sorry! Using iMessages as a sentence frame is great for ELL's because it gives them the freedom to choose their own emotions while taking away the anxiety of producing a full sentence. You could use this with special education or speech therapy students, as well. I just uploaded this lesson and activity to TPT, and you can find it here. Ahoy, matey! I'm linking up with the fabulous Miss Klohn over at Adventures of a 6th Grade Teacher to share our anchor charts. Here's one I made with my first graders. We have been doing Class News, an idea I got from Cara at The First Grade Parade. We made this to help us remember those tricky "Wh" words. My favorite part about making anchor charts is letting the students give me suggestions for words and images. Reading, writing, listening, speaking, all in one little activity. My 3rd and 4th graders are hard at work on verbs- all sorts of verbs. In some of their languages, subject-verb agreement does not exist. It sounds crazy, but it's for real. So getting them to put a singular noun with a plural verb is sometimes a Herculean task. Maybe I'm exaggerating, but I feel like I've been stuck on SVA (yes, we're on a nickname basis) since forever. In more verb news, we moved on for a few weeks to helping verbs and linking verbs. Don't worry. We are going back to SVA this week. Next week we're starting pronouns. I can see the future, and I can tell SVA is going to be a constant fixture. *Mental note...must laminate chart. 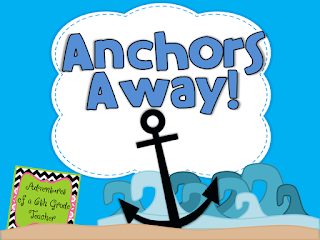 I'd love to see what your anchor charts look like! Link up with Adventures of a 6th Grade Teacher to share your work. Hello! I hope you have been enjoying your three day weekend! I know I have! 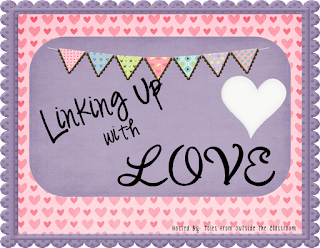 Before we left for the weekend, I did some MLK Jr. activities with my students, and I uploaded a Valentine's Craftivity to TPT, which you can find here, but what I want to share with you is something I'm calling Practical Math-gic. I do a Problem of the Day every morning as my 3rd and 4th grade class walks in the door. I meet with their classroom teachers regularly to see where they need help, and most of the time, they tell me "word problems!" In doing so, I noticed that most of my students have very little money sense. They have gotten SO good at finding the key words in the problem, but when it comes to money, they seem to get themselves all tangled up. Around Christmas I did a clean-out of my room and found some plastic fruit I had inherited from a former teacher, so I put it aside with a Post-it that said, "Use in money lesson." Friday was my chance! We had a half day and shortened periods, so it was the perfect time for a little bit of class grocery shopping. First, I set prices for each food item and displayed it on my projector. I made sure to use numbers some of them would have an easy time with, and some more challenging numbers as well. Then, I displayed my wares in the front of the room. When my students came in, I separated them into shoppers and cashiers, and gave each a pile of money. I only gave coins to the cashiers, since they were sitting at the desks and I knew that would be easier to handle. I told them they had a certain amount of money to spend, and they each had to choose three items. Then, they were off! Some students bought one item, made sure they had enough money, then went back for more. It was amazing to hear them speaking in money/math talk! "Come to me, I'll make you a deal!" said one super-smart student. "No deals allowed!" I yelled. Students who normally don't interact because of social issues were exchanging money and ideas, and all the while, they were doing math! It was amazing. Mid-way through, I pulled out a Daily 5 technique and "checked in" with the students who had shopped and the cashiers who had given change. "Show me how you did." Some had trouble doing math under pressure, some were indecisive about spending money. I have one student who is a spendthrift, and wanted to keep his fake money and not spend any at all. After checking in, we switched shoppers and cashiers. He's checking the prices to make sure he did his math right. I love it! My students love Class Grocery Store day- they think it's a game. I love Class Grocery Store day, because I know they are learning practical, hands-on, valuable skills that they will need later in life. What practical skills do you teach in your classroom? The last two weeks of August were crazy for me, as I'm sure they were for many of you. One of the things that was unfortunately neglected was the organization of my classroom library. This drove me insane! I had books sorted haphazardly by categories that no one but me could understand, like Seasons, Holidays, and Favorites. I'm telling you- they were crazy weeks. I'm not even going to show you a picture. It was that bad. Then came January. My students moved up a reading level (yay!) we are happily settled into our Daily 5 routine, and all my kids knew where to look to find a book. But I wasn't happy- I knew that the books weren't leveled, and I would have J or K level kids picking up a D or E level book again and again. Perfect time for a makeover. So, I went to Target. And I went to the arts and crafts section, where inspiration struck. I would simply use colored tape to "level" the books, and put a piece of the same color tape on the outside of the bins. Then, when I get more books and have to rearrange, I can add and take away tape from the bins easily. It seems like a good solution to me! And here is my finished product. It may not look very different, but it's different on the inside, and that's what counts! I will teach my kids all about the new color system, and make a key to go on the wall. How do you organize your classroom library if you have multiple grade levels throughout the day? What about one grade level? By categories, lexile, numbers? Let me know in the comments! One of my favorite activities to get kids engaged in writing is "Author Share." My 3rd and 4th graders do Work on Writing all week, then on Fridays I conference with them and send them back for edits. At the end of the period we all gather on the rug and whoever is reading can sit in my chair and share their stories. It is an absolutely wonderful 15 minutes. When they are done reading, the other students ask "Wh" questions, and I love it! This was a very early Author-Share (maybe even the first one!). I quickly changed my lay-out to give them more leg-room. What a fun and easy activity! More About Me, and a Hunt for Gold. Hello! I am back tonight to share some more about myself and my ESL program. I teach in a K-8 school, and my teammate and I split the grades. I teach grades 1, 2, 3, 4, and a class of 7th and 8th graders. My teammate (who is wonderful!) has K, 5, 6, a class of newcomer students, and a class of 7th and 8th graders. Some of my classes are mixed grades, and all are mixed proficiency levels. I am entirely pull out, and she pushes in for K.
For my 3rd and 4th grade mixed class, I do Daily 5 and Guided Reading. I have 90 minutes with them, so I see two groups (usually!) a day, at least twice a week. 1st through 3rd grade follows an RTI model, so I pull my kids out during that period. What is your ESL program like? In first grade our guided reading book this week was about gold, so I created an entire unit based on it. Today, as a culminating activity, we went on a hunt through the school for gold and recorded our findings. They were so adorable in the hallway, debating whether or not a star was yellow or gold! In the office, they went crazy for the buttons on our VP's jacket. They had to speak English to the office staff, which was great because sometimes the only people they speak English to are myself and their classroom teacher. It was a really awesome activity. Here they are filling in their recording sheet after we got back from our hunt. So studious! "I found gold in the hallway, hallway, board, eagle in the library, office. I like gold flowers." I found gold in the hallway, board, eagle in the library, tree and button, snowman. I like the gold hat." "I found gold in the hallway, board, eagle in the library, office, tree and button. I like the gold in the office because have lot gold in it." Adorable! 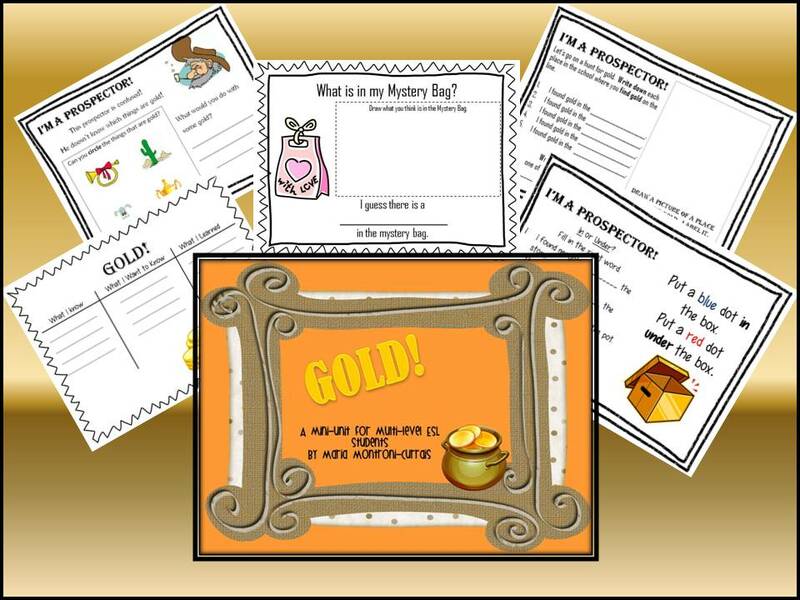 You can pick up the recording sheet, plus lots of other gold centers and an adapted version of The Golden Goose at my TPT store. Just click here! I'm interested to hear what the ESL programs are like at your schools- push in, pull-out, mixed? Let me know! My First Monday Made It! Hello! 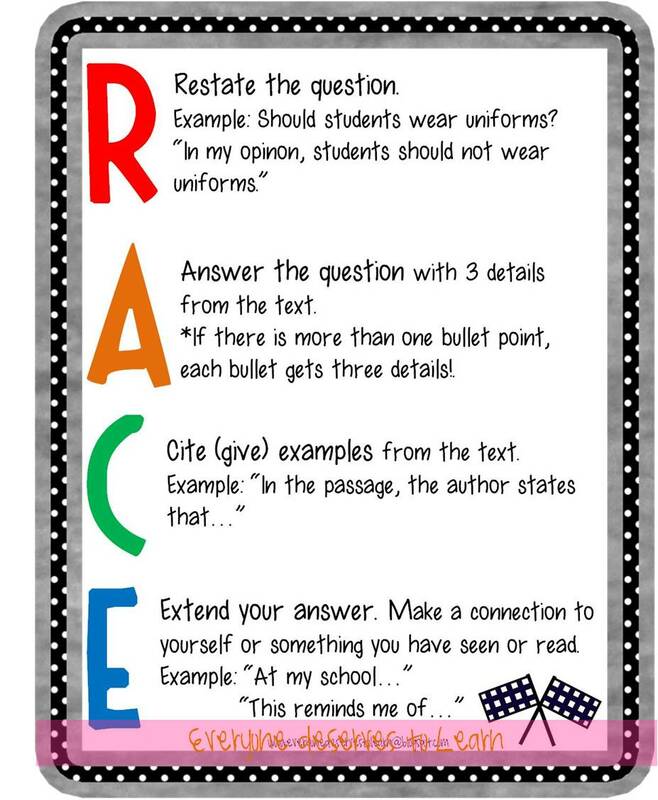 I'm linking up with Tara at 4th Grade Frolics for her January Monday Made It! I've been reading them for a while and was never able to participate, so I'm happy to be able to contribute! The first thing you need to know about me is that I love to cook! It relaxes me, and I look forward to it as I drive home from school. Therefore, my first Made It is not for the classroom, rather, it's a recipe from Food Network and it is fabulous and super easy. 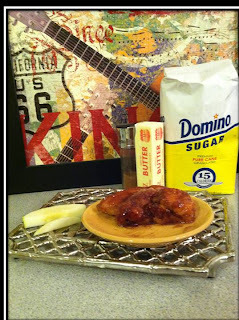 Apple dumplings by Trisha Yearwood are great for breakfast or dessert. My husband and I devoured them- they will not last long! Next up is my first unit for TPT, which I'm really excited about! My first graders were reading about gold, so I made a unit building background about the mineral, the color, rhyming words, same and different, and lots of other fun and important first grade skills. I also adapted "The Golden Goose" by The Brothers Grimm to work for various proficiency levels, and created some literacy activities to go along for my older students as well. You can find it here at my TPT store. Everyone deServes to Learn- an Introduction. Hello and welcome! My name is Maria, and I am an ESL teacher. Being an ESL teacher means I not only teach, but I am a coach, counselor, friend, and sometimes (at least I feel like) a parental figure. I teach in a very small school with a large ratio of ESL students, and many of them are refugees or S.I.F.E.'s. What are S.I.F.E.'s? Students with interrupted formal education- this means they may have started school, but due to conditions in their home country, they couldn't go back or just didn't go back. And now, they are in 4th grade or 6th grade with maybe a Kindergarten or 1st grade education. I have been so fortunate over the past six months to have had the help of my wonderful teammates at school in bridging the achievement gap for our students. However, I couldn't have done it without the resources and tips I have gotten from so many wonderful teacher-blogs I have found. Some of them are Ladybug's Teacher Files, Ms. M's Blog, 4th Grade Frolics, 3rd Grade Gridiron, Across the Hall in 2nd Grade, A Cupcake for the Teacher, and Step into 2nd Grade with Mrs. Lemons. Their endless ideas, resources, and materials have made me a much better teacher this year than I had been the previous year at school, struggling to come up with ideas to teach newcomers. Thank you, ladies. I plan to bring you ideas from the world of ESL, highlights from my school day, and materials to make your push-in or pull-out ESL classroom run smoothly. I have created a store at Teachers Pay Teachers with a few materials and will be updating it soon with new materials, as well as things I have already made and used with my students. I will be back soon with more information about me, but in the meantime, please let me know if there are any ESL-related topics or questions you have by leaving me a comment!